Welcome back to The Dog Pawlour blog! As a dog parent, the constant battle against dog hair in the house, in the car, and all over your clothes is an ongoing struggle with no end in sight; however, the love, companionship, and laughter our precious pups give us makes it all worth it. The fact is, dogs shed — it’s part of their biological makeup. Yet, there are ways you can minimize the amount of hair in your home, and today, we’ll share some helpful tips with you! Give your Top Rated Local® dog groomers in Greeley a call to book your furry friend for a dog grooming, or stop by to use our self-service dog wash stations. In the meantime, here are a few ways to keep dog hair under control. Feeding your dog healthy food is essential to the health of their skin and coat. A significant portion of the nutrition and protein in a dog’s diet goes toward growing their coat. Therefore, feeding them a healthy diet packed with vitamins and nutrients will not only maintain their overall health, but can also keep their coat strong and shiny, which may reduce extra shedding of dead hair. If you read our last article, we talked about the importance of brushing your dog regularly. One of the benefits of consistently brushing their coat is that it removes dry, dead hair, distributes their natural oils on the skin, therefore, stimulating new hair growth. Regular brushing, especially for long-haired breeds, can control the amount of hair shed in the home. Talk to your friendly dog groomers to get recommendations for the best brush for your dog’s coat. You can limit the amount of hair that sticks to furniture and bedding by covering up these objects. Slipcovers are great for controlling hair on couches and loveseats, plus, there are different brands of stylish slipcovers made especially with dogs (and cats) in mind. If your dog sleeps in bed with you, keep them out of your room during the day by blocking the entry with a baby gate. Then, at night, cover your bed with a sheet to protect your bedding from dog hair buildup. Shake the sheet outside or replace it with a new one each night before bedtime. It’s important to clean your dog’s bedding regularly to not only keep it clean, cozy, and smelling pleasant, but to minimize dog hair buildup. Most dog beds feature a removable cover that can be thrown into the washer. At minimum, you should remove the cover and shake it off every one or two days to get rid of shed hair. 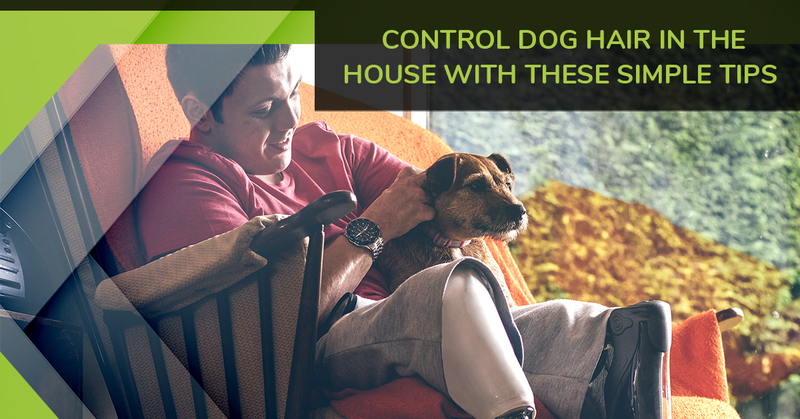 You can even use a handheld vacuum to remove the dog hair from their bed. Whether you prefer to groom your furry friend at home, or you would rather take them to professional dog groomers, consistent dog grooming is essential to your dog’s health, and it can significantly reduce the amount of shedding in your home. Talk to your local groomers to get their grooming recommendations for your pup. If you like to groom your dog yourself, The Dog Pawlour has self service dog wash stations where you can safely wash your pup without the hassle of bathing them in the bathtub. Or, if you’d rather, leave it to the pros, our dog groomers would love to get your dog looking, feeling, and smelling amazing. Call us to book a dog grooming in Greeley or Fort Collins and experience the DP Difference!